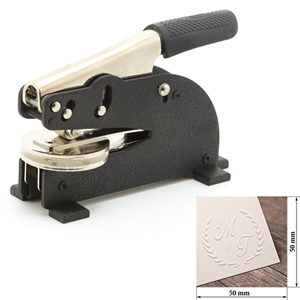 Congratulations on your new embossing seal! May this unique piece bring you much pleasure! Before you get started embossing everything you can get your hands on, let’s just go over the basics in our embossing seal user guide You can emboss a lot of paper and card stocks, but the results will be different based on a number of factors. The ‘GSM’ (thickness) of the stock is a good indication. The higher the GSM, the more pressure will be required. You will also have to take notice of how the stock has been made. This embosser can emboss right up to 300 GSM! Cheaper or cheaply made paper stock will shred under even the smallest amount of pressure, so testing before you commit to a large purchase/ print job is suggested. So with thinner paper, don’t press too hard. In fact, if a thin good quality paper is to be used, place a spare piece of paper underneath it for best results. For thicker paper, press harder. If you consistently experience shredding or tearing and even lighter pressure doesn’t work, you will have to consider changing your paper stock.